A Plugin for MyBB to jump to the last post of the user in a thread. My first approach to develop a MyBB plugin. Hope this will be helpful. This tiny plugin will add a new link to every thread at thread tools (bottom left) for the users to jump to the last post made by him / her in a thread. This is a good way to read forward from where the user has left the thread. The link will not be displayed for the guests. 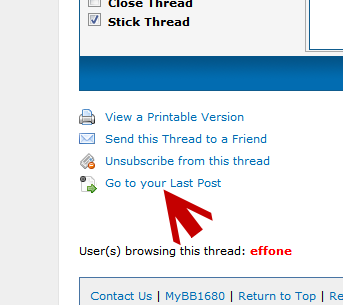 Those who didn't post in a thread, clicking on the respective link will return them a custom error message stating they have not posted on that thread.